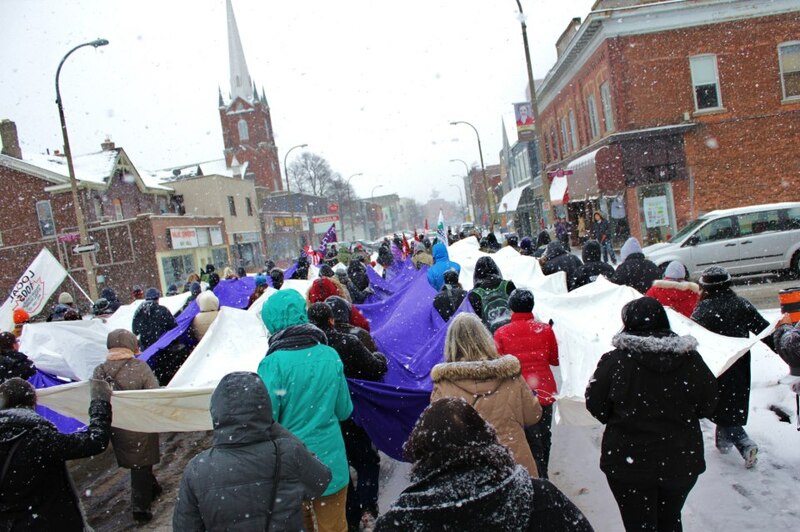 The March was a great success with around 150 folks braving a snow storm to take to the streets of St. Catharines to honour the Guswenta (The Two Row Wampum). We will be posting more report backs shortly – but for now we want to share a photo from the day and direct others to the event page where folks have been adding photos, videos and news coverage. Thank you to all who supported! Join us on Saturday February 2 @ 11:00 a.m. for a Giant Two Row march through the downtown of St. Catharines! Gather at St. Catharines City Hall for a march ending at Montebello Park. 2013 is the 400th anniversary of the “Two Row Wampum Belt” – the Guswhenta – and represents the oldest living treaty between Haudenosaunee folks and settlers. It is the foundation for a relationship of peace, respect, and friendship as well as non-interference. We hope to educate settlers in the area about the Two Row and celebrate a relationship based upon honouring treaties. The Giant Two Row March!